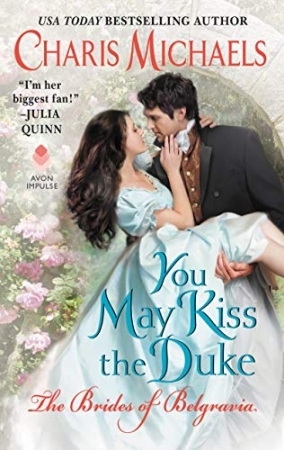 Against her better judgement, spirited beauty Sabine Noble agrees to speedily marry a stranger who can remove her from the home of an abusive uncle. The union allows her to relocate to London and start a new life writing travel guides and enjoying the city on her own terms. Sea Captain Jon Stoker has no desire to be a husband, but Sabine’s offer of a commitment-free marriage and a hefty dowry is hard to refuse. After he delivers Sabine from her violent uncle, the deal allows Stoker to say good-bye and sail away. 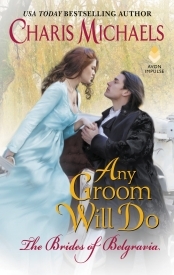 When Stoker’s travels put him in harm’s way, neither dowry nor freedom can save him. His unconscious body is returned to England, and a chance discovery by his estranged wife rescues him from the morgue. Sabine is uncertain of her responsibilities to the unconscious husband she barely knows, but she begins the reluctant job of nursing him back to health. In the private confines of Sabine’s bedroom, the estranged husband and wife reckon with the attraction that has been there all along and the new, hot-sparking desire. And when Stoker has recovered and Sabine takes revenge on her dangerous uncle, they realize that attraction and desire have evolved into love. Sabine Noble agreed to marry because of a cupboard. It was a cedar cupboard, built into the wall of the green salon, formerly used to store table linens and silver. Now the linens were draped over furniture, and the silver had been long sold. The cupboard sat empty, a three-foot-by-three-foot space, secured from the outside with a wooden peg. The cupboard represented a new level of humiliation for Sabine. She couldn’t explain the cupboard away with a lie about a fall from her horse or an accident on the stairs; and dark, tight spaces elicited a particular sort of hysteria. Perhaps it was understandable that Sabine was not herself when she was finally, unexpectedly, released from the cupboard after forty-five terrible minutes of dark, airless indignity. Perhaps the cupboard—or rather freedom from the cupboard—was the perfect storm of relief and opportunity and panicked going-along. Perhaps she wouldn’t have agreed to the marriage if her uncle hadn’t locked her in the cupboard on the first day Jon Stoker came to call, but he did lock her in, and this is the story of what came after. Jon Stoker agreed to marry because saving women had become a rather burdensome lifelong habit, and Sabine Noble was meant to be his last hurrah. Stoker had turned up to Park Lodge that day, uninvited and unknown to Sabine or her uncle, due to an advertisement that Sabine and her friends had posted in London. The advert offered the girls’ dowries in exchange for marriages of convenience. The girls hoped to gain access to London after speedy marriages to sailors who would be rarely, if ever, at home. Stoker wanted no part of it, despite the unexplained enthusiasm of his business partners. He’d called that day for no other reason than to tell her that he’d been volunteered out of turn; marriage was not in his future, thank you, but no. He was met on the doorstep by an impervious old man who tried immediately to send him away. Stoker heard shouts of distress from inside, banging, muffled cries for help, and he forgot the advertisement and stepped around the sputtering old man to follow the sounds. For ten minutes Stoker prowled the ground floor, his ear cocked to the cries, while the man threatened eviction and the sheriff. Stoker ignored him and located the source of the noise in a back parlor. A cupboard, its hinges rattling with blows from inside. He removed the lock and whipped the doors open and Sabine Noble tumbled out, gasping for air. Jon Stoker’s life was forever changed. Sabine recovered with the speed of a woman prepared for the next terrible blow. 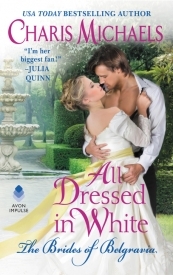 She darted behind a chair, gasped for breath, and shook her hair from her eyes. When she looked up, she saw a stranger shoving her uncle into the very cupboard from which she had just been released. “Duck,” the stranger ordered Sir Dryden, his hand pressing the older man’s head. “Duck,” he said, louder. Sir Dryden ducked, the door was slammed shut, and the stranger turned calmly. Sabine gripped the back of the chair. “I’m Jon Stoker,” the stranger said. Sabine nodded cautiously, too breathless and hoarse to speak. She touched a hand to her swollen eye. She tasted blood on her lip. He watched with solemn patience, no wincing, no reaching out, no bellowing for a maid. He waited. “Mr. Stoker,” she finally repeated, but she thought, Who? When realization dawned, it was as swift and painful as Sir Dryden’s backhand. No, she thought, disbelieving. Her hands slid from the chair and she took two steps back. Jon Stoker was the name of the man who had answered the advertisement posted by her friends. The advertisement for a husband. Jon Stoker, her friend Willow had told her, had been the applicant most suited for Sabine. Jon Stoker could only be here for one purpose—a proposal. To her. Today. On this of all days. As her face swelled and her lip bled. As her uncle began to slowly knock a bony knuckle against the inside of the cupboard door. Sabine closed her eyes, willing herself to disappear. She willed Jon Stoker to disappear. She willed Sir Dryden to hell and beyond. Sabine did not answer, and she wouldn’t answer. She wouldn’t look at him, or make excuses, or thank him, despite the fact that he deserved her gratitude. And she certainly would not marry him. The advertisement had been her friends’ mad scheme. Sabine had gone along because she’d never thought it would come to anything. She turned and began to weave through the furniture to the parlor door. Sabine picked up speed. She darted through the door, bustling down the corridor. Bustling? No, she was fleeing and Sabine never fled. Her face burned with fresh shame. Was it not enough to suffer the humiliation of being beaten by a tyrant uncle and released from captivity in her own home? Must she also be chased? Sabine missed a step but kept moving. The advert, the advert. Sabine swore in her head. Her friend Willow had proposed the advertisement on a day like today, when Sabine harbored a broken rib and her future with Sir Dryden had seemed like certain death. Sabine had acquiesced, and now someone named Jon Stoker was here, witnessing one of the greatest humiliations of her life, and unbelievably, she did not hate him. Yet. Sabine stopped short and grabbed the wall to keep from pitching forward. She glanced over her shoulder at the tall, dark man. She thought, He must be as desperate as I am. Now Sabine paused. She was not in the habit of answering personal questions from strange men. As a rule, she did not answer personal questions from anyone or speak to strange men at all. But Jon Stoker was so incredibly matter-of-fact, so level. She could not have tolerated hysteria or bluster. Sabine thrived on calm, and Jon Stoker appeared the very soul of calmness. And, best of all, he didn’t ask why. Why did he lock you in the cupboard? What did you do to invite a blackened eye or a bloody lip? The answer was, she’d refused to serve Dryden’s cream tea. He’d proclaimed that a proper lady should serve the master of her house, and she’d said, Pour your own bloody tea. And off they went. To blows. To the cupboard. “There was a broken rib, I believe. Or two.” Sabine hadn’t realized the relief of actually telling someone. Especially someone she did not know and who would leave here in five minutes. She’d hid the worst of the abuse from her mother and her friends. She was so very ashamed—and what could they do? The helplessness was as terrible as the pain. Yet, here she stood, telling this man. “But his attacks,” asked Stoker, “do not extend to—?” He stopped, ran a hand on his neck, and began again. “That is, he does not . . . ?” Another pause. His flat tone had taken on a stratum of something harder, something decidedly less calm. She shook her head. No. Thank God. Not that. Stoker nodded and looked away. He took a deep breath. “You cannot remain here,” he said. Sabine could not know it, but Jon Stoker had rescued hundreds of girls over the years—not because he’d married them, but because he’d beaten down doors or stabbed oppressive men or stolen them way under the cover of night. Some said he’d been born a hero; others said he fought in memory of his desperate mother. Stoker said he was in the wrong place at the right time. All too often. Regardless of the reason, regardless of their prisons, he always said these same words. You cannot remain here. It was routine. “And how effective are you at these endeavors when you are under the dominion of this man?” Stoker asked. Sabine looked down at her hand. A bruise shined from her smallest finger, a remnant of the week prior, when Sir Dryden had come upon her at the drafting table and pressed a paperweight into her hand. Sabine looked at him. There were reasons, and then there were fantasies made up by well-meaning friends. The advert had been a fantastical, made-up thing. “I have no wish to marry,” countered Stoker. It was not what she expected him to say. He’d been asking for ten minutes if the advertised proposal was still on. He stood five feet away, feet planted. Leaving seemed the furthest thing from his mind. He studied her as if she knew the solution to a problem that could change both of their lives. For the first time, she allowed herself to look at this man, to really look at him. He was large, of course. Sir Dryden had not fought him because Jon Stoker was large and her uncle was a coward. He wasn’t simply tall, however. Stoker was broad-shouldered, with a substantial chest, flat middle, and long, thick legs. He had the physique of a farmer, someone who lifted heavy things, who plowed and chopped. His face was tan and weathered. He was older than she was but not so very old, ten years beyond her own twenty-three years, perhaps? He had black hair, rather like a pirate. Later Sabine would scold herself for standing before him, wounded and embarrassed, and inventing the label farmer pirate. Vigilante stonemason and blacksmith warrior also came to mind. Had she hit her head in the cupboard? “I beg your pardon?” Only a lunatic could follow this conversation. He paused, studying her, almost as if he weighed the benefits of answering. Sabine crossed her arms over her chest. Oh, you will answer. It’s only fair. Now he crossed his arms over his chest. His expression said, That should shut you up. If she was to pinpoint a moment in the conversation when she went from resisting this madcap scheme to actively campaigning for it, it was now. The words I have no wish to marry had allowed her to reconsider. “The advert was an aspirational daydream engineered by my friends. I never expected it to elicit someone like you.” She looked him boldly up and down. She continued as if she hadn’t heard. “And if you have no wish to marry, and I have no wish to marry, then we could, in theory, marry in name only and part ways. I will go to London with my friends and enjoy the freedom of a married woman. You may . . . go wherever you will go and do whatever you do. We shall live separate lives. Oh my God, this might actually work.” Sabine felt a little breathless. The terror and humiliation of her uncle’s dominion had been so oppressive, the possibility of some deliverance, any deliverance, felt like a gag had been removed from her mouth. “You cannot remain here,” he repeated. “I do not strike women,” he said. Sabine’s heart had begun to pound like she was running a race. This conversation felt very much like a race. They had begun to walk, and then he walked faster, and then she walked faster, and then he had begun to run, so she began to run, and now they were both sprinting side by side, trying to keep up. “I swear,” Jon Stoker said slowly, and Sabine thought, My God, what if this actually works? It had been a true statement; Stoker did not strike women. Also true, she could not remain here. But he’d lost track of whether he was trying to convince her of something, or she was trying to convince him. You will save her by marrying her, he thought. She will die if you do not. “This is madness,” she said, letting out a little laugh, and she turned away. Stoker felt something like panic rise in his throat. This, he elected not to answer. Stoker was not accustomed to women weighing his aspirations or his happiness. He also was not accustomed to lying. He was many regrettable things, but never dishonest. He opened his mouth to say, I don’t require the money, not in the way my partners do, but the look on her face caused him to close it. He paused. Stoker and his partners were embarking on an import voyage to bring guano fertilizer to the farms of England. It was new and untried and potentially a windfall beyond their wildest imaginings, but they could benefit from some financing to raise a crew and provision. They’d considered the girls’ advertisement because their dowries would finance the first expedition and then some. That is, his partners had considered the girls’ advertisements. His partner Joseph had fallen into something like love-at-first-sight with his potential bride. And Cassin really did need the money. Stoker was not in love nor destitute. But what if he married as a way to end the exhausting business of saving people? No more Stoker as hero, Stoker as savior, Stoker as someone else’s deliverance from . . . whatever. The sacrifice of marrying Sabine Noble—of marrying anyone at all—would be so great, he could retire. After her, he could walk away. It was helpful that the marriage described by Sabine was meant to be completely detached, with oceans between their lives, and wholesale unaccountability. It was really no marriage at all, except by name. Stoker took a deep breath. He looked her over once again, and she raised up to her full height. She hiked her chin. He felt something twitch and sink inside his chest, like sand dropping into a hole on the beach. This was a woman who had choices, he thought. She could have her pick of men. The dowry she advertised was significant and her beauty was dark and rare and, if he was being honest, took his breath away. Coal-black hair, long lashes that shielded emerald eyes, perfect nose, perfect mouth—perfect everywhere. Even beaten by her uncle, even desperate, he could not look away. “For the dowry money,” he heard himself say. He would blame it on the money but know it was one final act of altruism for a pretty girl in a bad situation. “Right,” she said, her voice tentative but also official. “You will do it for the money, and I will do it to leave Sir Dryden. I suppose it’s all settled.” She took two steps back. The print edition of this title will follow the ebook by about a month.